Neil Gaiman's Journal: A bit sad. But it ends with Toast. A bit sad. But it ends with Toast. Now I'm home. Typing a blog entry, listening to TV Smith's Live CD. The saddest moment of the trip was lunchtime today, and a call from Roz Kaveney to let me know that our friend Rob Holdstock had died, of an e.coli infection. He was only 61. When I stumbled into the world of SF and Fantasy, over 25 years ago, as a young journalist, Rob, already a successful and award-winning author, was absolutely friendly, welcoming and encouraging. A big, affable man, with a knack for putting people at their ease, he was always one of the Good Things about the British SF world. His book Mythago Wood was one of my favourite novels of the 1980s. I saw him less and less since I've lived in the US; like too many UK friends, I'd see him mostly at publishing parties and book launches. He died too early. My condolences to Sarah, his partner. Two NPR pieces I should point people to. One is my guest-spot on "Morning Edition", talking about, and interviewing people about, Audio Books, at http://www.npr.org/templates/story/story.php?storyId=120769925. The other is "On The Media" , at http://www.onthemedia.org/episodes/2009/11/27. I'm one of several people talking about the future of the book (or The Future of The Book). Big congratulations to Henry Selick, to all at Laika and to Focus for the Coraline Film, which won the Children's Feature Film award at the BAFTAs last night (http://www.bafta.org/awards/childrens). The Green Goddess restaurant in New Orleans gets reviewed in the New Orleans Times-Picayune. Note that they do not tell you that if you oh-so-casually ask for the Meze of Destruction, they will make a fuss of you and bring you Something Nice, for this is something you would only learn here. And finally, over at http://twitpic.com/rhg4t, @heydeletethat does portraits of me and Amanda. On Toast. 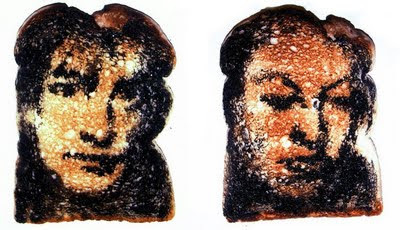 I mean, that's art on Toast.